The incidence of birth trauma that causes permanent injury to babies has been estimated at 2 to 7 per 1,000 live births. Sometimes a baby has problems being delivered because of an abnormally large body, a disproportionate head, a difficult labor, prolonged labor, and the presentation of the feet instead of head childbirth (breech). A fetus needs to be monitored closely with fetal monitoring to determine the status of the fetus since complications may suddenly arise. 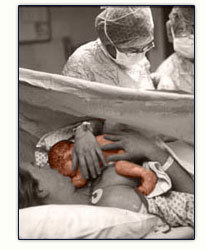 Often, a cesarean section is needed to deliver a baby. Other birth injuries include birth trauma which refers to a collection of injuries that can occur just before, during, or immediately following birth. Birth trauma injuries may include cerebral palsy, shoulder dystocia, and brain damage. Birth trauma can occur when the flow of blood (and thus of oxygen) is inhibited during birth. When this occurs, the physician must act quickly to prevent permanent injury. By definition, “Birth trauma” can involve any part or portion of the mothers or child’s body, including any organs or limbs. The more severe forms of birth trauma usually involve injury to the brain and/or nervous systems. The brain requires a large amount of oxygen to survive and to function and is the primary center for regulating and coordinating all body activities. The transmission of oxygen to the brain from the respiratory center is crucial to maintenance of the brain and support of its vital functions. Birth trauma can result from mechanical injury, such as improper application of obstetrical forceps to a baby’s head during the birth process. Severe, moderate or mild damage to the brain caused by low oxygen supply (hypoxia or anoxia) during labor may cause permanent injury and a variety of neurological problems. The Medical Malpractice Law Firm Attorney has successfully litigated many medical practice cases involving birth negligence. If you need a medical malpractice lawyer in Dallas, Texas use the contact form provided.